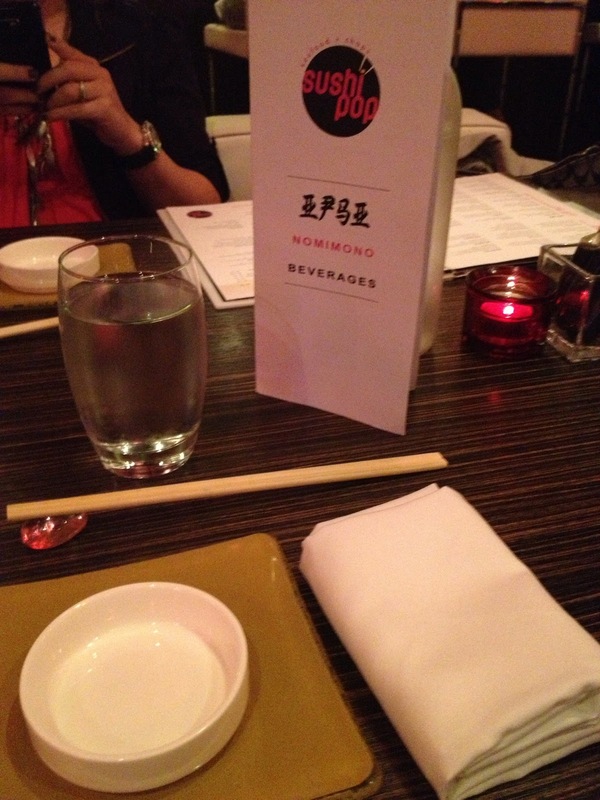 Home / Random Places / Pop Goes the Sushi...Literally. 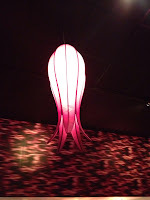 From all angles, this restaurant is just plain cool. From the staff uniforms to the paintings on the walls, you are already entertained and you haven't seen the menu. This is an a la carte sushi bar with a strangely intriguing menu. I've been to many sushi restaurants, but nothing like this one. The only 'normal' roll they offered was the California roll. You MUST look at the menu on their website. These crazy combinations definitely put the Pop in Sushi Pop! The desserts even had Pop! Not your usual ice cream and tempura banana, that's for sure! 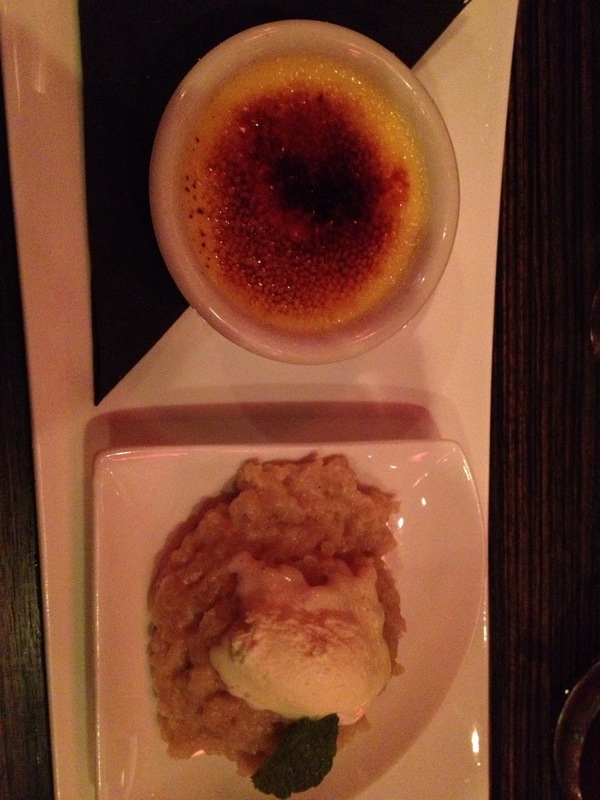 I ordered crème brulee, because I'm addicted. 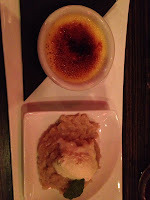 It was passion fruit and came with cinnamon rice pudding. The custard was cold and could've been thicker, but...who's being picky? ;) Maria got the apple fritters. I know, apple fritters at a Japanese restaurant. I was thinking the same thing, but they were goooood.....and were supposed to come with candied bacon, but they were all out. Shocking! My friend got PMS, which is peanut butter, molten chocolate and salted caramel ice cream. 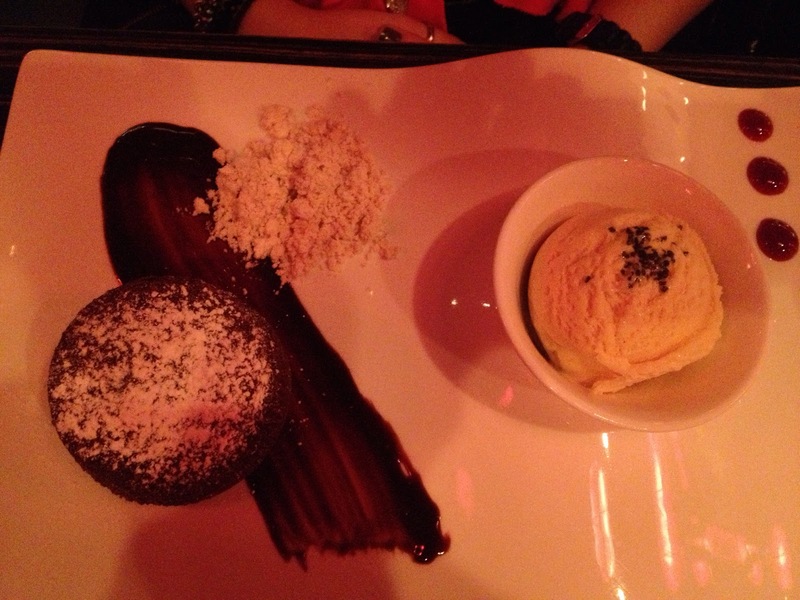 I only snuck a taste of the molten chocolate. It was a strange looking dish, but she loved it. Next time I'm in Florida, I HAVE to go back. There's so many things to try! Anyways, to start off this place was pretty cool - you walk in and you are just overtaken with the décor and ambiance of the restaurant. Maybe it was just me (because I am weird and geeky) but I almost felt like it was too cool for me - like I was back in high school and I just walked up and sat at the "cool kids" table without being invited. I kept fidgeting with my clothes worrying I didn’t look cool enough to be there. But the servers and hostess were really nice so I think that help set aside some of my weird anxiety. Secondly - I have said it before, I will say it again - I don't do sushi. I have tried it and tried it again. I just can't do it. Do I hope one day and my big girl taste buds kick in and allow me to enjoy it? Yes. But for now - let's just settle on the fact that it means more sushi for you people and I am just "missing out" mmmkay?! For that reason - when I am going to a new place that prominently featured as a "sushi" place - I check the menu online to see what else they have to offer. I like to see this as a benefit to blogging - I am sneaking in the back door to see that the non sushi items are on an equal level to the sushi ( oh I am a sneaky one). Because of my research I kinda planned out what I was going to order. I had full on committed to the sautéed garlic edamame. I love garlic and I had recently discovered my love of edamame so I figured "score". (with a hubby allergic to soy - I think of edamame as my secret lover, lol). 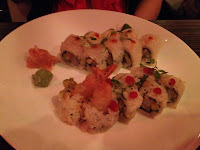 The second dish I had decided on was a shrimp and veggie tempura - that had a cute name that I can no longer remember. At the actual restaurant I came to find it was no longer on the menu. Instantly my brain started to scramble - on one hand I had really gotten excited for the tempura - I hadn't had it in ages. Secondly I was rushing to find something to order instead. Then, as if a choir of angels was singing to me - the waiter told me there would totally be able to make it for me still. Be still my heart! 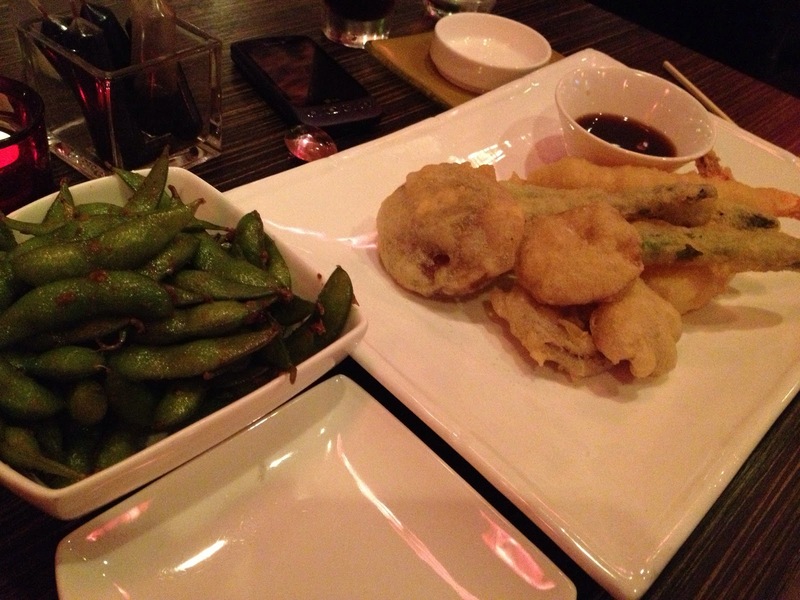 My food was delicious - the edamame was so garlicy - heaven. My tempura was wonderful - super fresh. The batter was a bit thicker than I was used to but the flavour was there. Huge shrimp and a variety of veggies. 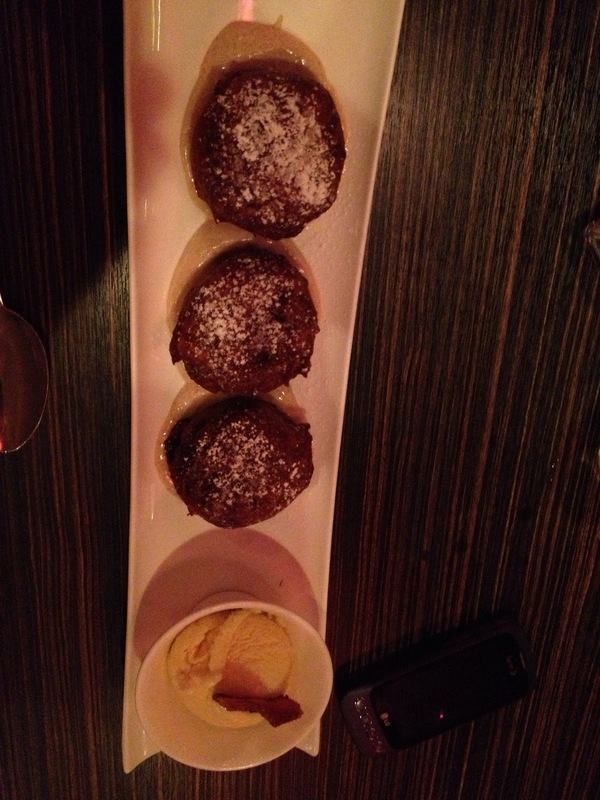 I am not really sure how we decided dessert would fit in our tummies, but we did. I ended up with the Chinese 5 spiced apple fritters with cinnamon whipped cream, maple ginger ice cream and candied bacon. Lisa seems to believe there was no candied bacon, but there was - it was a small piece and I didn't share, lol. It was the candied chicken skin they didn't have anymore of...that's right... candied...chicken... skin (let that one sink in a minute.....good? ok lets keep moving.) 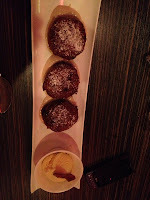 The fritters were pretty good. A couple were a little doughier than I would have liked. but the ice cream more than made up for that. The candied bacon seemed like a after thought to make it "trendier". Don't get me wrong.. I ate it and enjoyed it. But it was too small a piece to really impact the dish in any way other than going "oooh candied bacon." Overall, the dinner was lovely, the servers were wonderful and my tummy was happy. I will definitely be going back again.